Dr. Patel takes the time to explain the results of your eye exam, describe your options and listen to your eye care needs. Because maintaining good eye health is an ongoing partnership, we encourage you to ask questions and share your health information, which could be vital to monitoring, diagnosing and treating potential vision problems. 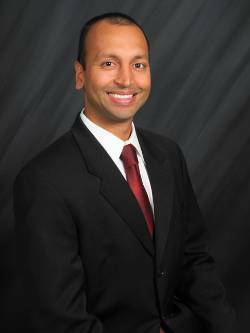 Dr. Nikil Patel is a certified optometrist through the National Board of Examiners in Optometry. His academic accomplishments include a Bachelor’s of Science degree in Biology from Indiana University followed by obtaining a Doctor of Optometry degree through the prestigious Indiana University School of Optometry. Dr. Patel’s intense and thorough training has included time spent at institutions such as Aran Eye Associates (Miami, FL), Guanajuato Eye Clinic (Guanajuato, Mexico), Lackland Air Force Base (San Antonio, TX) and LASIK Vision Institute (Atlanta, GA). Dr. Patel has been living and practicing in the Atlanta area since 2004. Dr. Patel has a special interest and expertise in fitting specialty contact lenses such as multi-focal and astigmatism correcting lenses and corneal reshaping lenses that can eliminate the need of glasses or contacts during the day. He has managed and treated thousands of patients with ocular diseases such as macular degeneration, glaucoma and diabetic retinopathy among many others. He also specializes in treating patients that have undergone LASIK and cataract surgery. Since 2010, Dr. Patel has been fitting patients with specialty lenses like orthokeratology. Dr. Patel is a member of many professional organizations including the American Optometric Association, Georgia Optometric Association, Greater Atlanta Optometric Association as well as the Beta Sigma Kappa National Optometric Honor Society. He serves on the Board of Directors for the Energeyes Association. He is a certified practitioner of the Paragon CRT (Corneal Refractive Therapy) and also a Certified WAVE Contact Lens Designer. Dr. Patel enjoys and feels it is important to volunteer his services to those who are less fortunate. He has participated in the following programs – Georgia Lions Lighthouse, Luxottica’s Gift of Sight and One Sight, Essilor’s Kids Vision for Life and World Sight Day. Dr. Patel had the esteemed honor to be selected to the inaugural Advisory Board for the Dry Eye Centers of America. Outside of the office, Dr. Patel enjoys sports, spending time with his wife, Shivani, and two children, Ishan and Zara.